Blueberry French Toast with Lemon—Super Easy to Make! No matter your ability level in the kitchen, you can impress mom with this Lemon Blueberry French Toast. This recipe is ridiculously easy to make and a total delight to eat. It’s soft and fluffy inside, lightly golden and crisp on top, and bursting with juicy blueberries in every bite. The touch of lemon is fresh and lively, and it makes the French toast casserole feel especially fitting for spring. 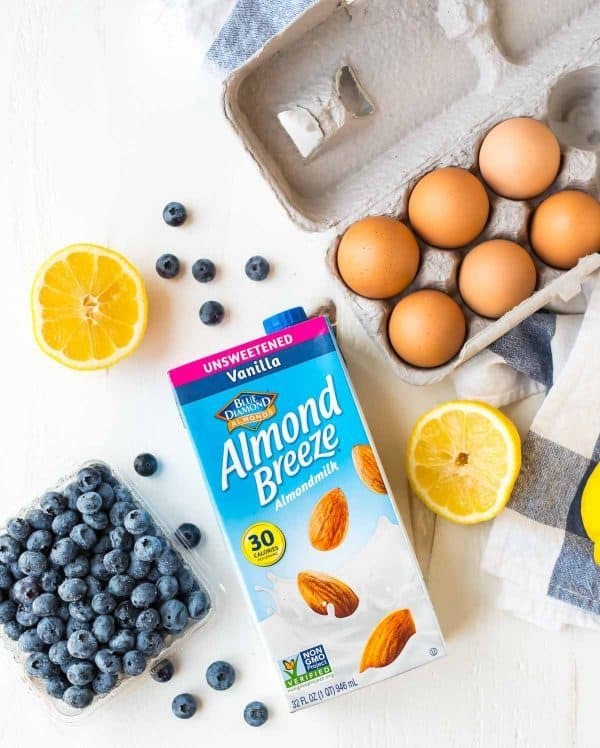 Despite its creamy, custardy texture, this overnight blueberry French toast is on the lighter side and dairy free, thanks to unsweetened vanilla almond milk. I first started using almond milk in my cereal and smoothies because I enjoy its taste, and it’s since become my go-to for healthy baking as well. In addition to the almond milk, I lighted up the blueberry French toast recipe further by using a higher ratio of egg whites and sweetening it with maple syrup instead of regular sugar. The result is a (relatively) healthy blueberry French toast that tastes just as fabulous as its more decadent counterparts. 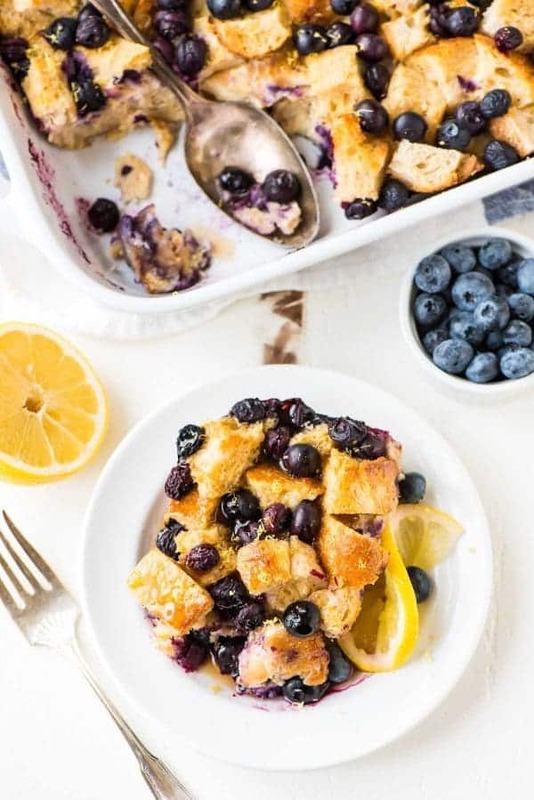 You can serve this Lemon Blueberry French Toast with maple syrup, keep it simple with a light dusting of powdered sugar, or avoid the decision all together and douse it with both. French toast casseroles are also super freezer friendly, so if you prefer, you can even make it well in advance. Coat a 9×13-inch casserole dish with nonstick spray. Arrange the bread cubes (see notes if the cubes are still very soft or fresh) in an even layer in the pan, then sprinkle the blueberries over the top. Set aside. In a large mixing bowl, whisk together the eggs, egg whites, almondmilk, maple syrup, lemon zest, lemon juice, vanilla, cinnamon, and salt. Pour over the bread. Cover the pan tightly with plastic wrap and place in the refrigerator overnight. (If overnight is not possible, I recommend a minimum of 2 hours). When ready to bake, remove the pan from the refrigerator. Place a rack in the center of your oven and preheat the oven to 350 degrees F. Bake, uncovered, for 45 to 55 minutes, until lightly golden brown on top and the bread in the center is moist but no longer liquidy. Serve hot, dusted with powdered sugar and topped with butter and maple syrup, as desired. *If time allows, I recommend setting the cubes out overnight to dry out so that they absorb the max amount of custard. If your bread is still fresh or very soft, toast it in the oven first: Place two racks in the upper and lower thirds of your oven and preheat the oven to 350 degrees F. Spread the cubes out in a single layer on a large baking sheet. Bake for 10 minutes, until lightly dried, tossing once halfway through. Use in the recipe as directed. To freeze unbaked: Prepare the recipe up to step 2, but do not refrigerate overnight. Instead, place in the freezer and freeze for up to 2 months. Thaw overnight in the refrigerator, then bake as directed. To freeze baked: Let cool completely, cover tightly, and freeze up to 3 months. Let thaw overnight in the refrigerator and warm up in a 350 degree F oven until heated through, about 30 to 40 minutes. If the French toast starts to become too brown while you are reheating it, cover with foil, then continue baking until hot.